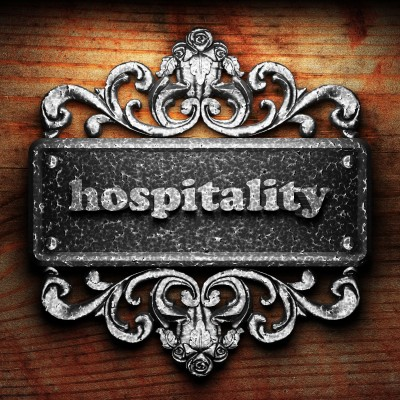 Hospitality is a term that seems to be fading away in today’s culture. People are becoming much more reliant on themselves. Unfortunately, this is creating a mindset of “I don’t want someone to have to do something nice for me.” I remember growing up and going to visit my grandma. I realize now that I am older that I loved going to her house so much because of her hospitality. She always fed us three square meals a day and she let us use her home as if it were our own. She loved us through action and not just by saying “I love you.” Now-a-days, people would rather go out to a restaurant than invite people over and cook for them. Entertaining can be a chore with all that goes into it, but the benefits outweigh the pains. Let us look into scripture and see what God says about hospitality. This is a great article and so true; we, as Christians, should practice hospitality above everyone else, as this is commanded by our Lord. Sadly, however, when it comes to this matter, one can barely tell the difference between a believer and one who does not know Christ. After, I finally got committed to God’s calling, this is probably been one of my greatest challenges… dealing with very careless, thoughtless and unhospitable “christians”, those whom were suppose to show me the love of Christ, have been so often nothing more than a stumbling block with their lack of love. This is sad, as they deceive a world of people looking for Truth and who can’t tell the difference between those of the Faith and those of the world, like them; thus giving true Christianity a bad reputation. So often times, I’ve been told by unbelievers whom I’ve tried to relate the Gospel, that they know many “christians” whom they really don’t want to be anything like and rejecting the Truth of Jesus, not realizing that these so called christians are nothing but hypocrites. Thank you Mabel. Unfortunately, you are right. There are so many Christians out there that don’t practice hospitality and they do look hypocritical. The whole point of Christianity can be summed up in the word “Servant.” We are called to be servants and love others just as Christ has loved us. Thank you for your thoughts Mabel and God bless you. Perhaps, those without hospitality skills are babes in Christ. When one is born naturally or spirirtually, he/she must grow & mature. No natural born person came to earth walking, talking, nor feeding him/herself, & etc. Spiritually born babes have a lot to learn. All is not learned overnight. Let us pray for all christians everywhere – that we all look-like, behave-like, & be more Christ-like each & everyday. Excellent point Yvonne! I didn’t think about it from that point of view. I agree, we all need to pray for all Christians everywhere. Prayer is our greatest weapon here on earth. God bless you! May peace be multiplied to you. Thanks for responding. As a seasoned; but, still growing christian, I failed to see my opportunity to be more gracious, helpful, and hospitabile. I failed to encourage Mabel to be patient with other folks. I failed to commend Mabel. After all, she has “finally got committed to God’s calling.” Perhaps, the LORD has specifically placed Mabel where she could assist others learn to be more hospitable. The LORD is still a potter doing work among the folk that HE has called into HIS fellowship. He often works through other folk. When one believer helps another to grow spiritually, a loving bond usually develops. Christ died on the cross while I was yet a sinner. Now, I am in the “exclusive christian club” – among a faith based bloggers, I failed to solicit prayer for the lost & apparent hypocrites. I give thanks to GOD for forgiving me of my many shortcoming. Many blessings to us all as we strive to do our best to live to give GOD glory & love all mankind. Yvonne, I can see from your responses that you have a tender heart and that is a blessing in itself. As the old hymn goes, “Earnestly, tenderly Jesus is calling. Calling oh sinner come home.” I encourage you to use that tender heart to keep loving others as I am sure you already are doing. I feel the regret in your words about Mabel and I understand from the failures I have had in my life. If you haven’t forgiven yourself for your shortcomings with Mabel, please pray to God about it. I know I beat myself up way too long sometimes over mistakes that I make, but that can be a ground for the devil to take hold in. He loves broken hearts. He loves keeping us in a state of regret. The devil’s business is pain and suffering. God’s business is love and healing. God bless you Yvonne. I know you are a blessing to others. Stay strong in your faith and know that wherever Mabel is, she is in God’s hands too. Blessings on you! Superb work Derek. I love the one about angels because we may be “tested” to see if we are going to extend hospitality, even to strangers for these may be the hardest to trust and extend hospitality too. I wish I could replicate what you have written and I get the feeling that you are the epitome of hospitality in word and in deed. Well done brother. Thank you Jack. Your last statement was very kind. I still have a long way to go in being hospitable to everyone. God is gracious enough to love me anyways through my stumbling. As long as I walk with our Lord, He will keep molding me into what He wants out of me. I am learning as He is teaching. God bless you brother. How we conduct ourselves is the strongest witness for Jesus, or against Him if we act badly. Thank you for this encouraging article. Thank you Robert. I learned a lot while writing this one. It was a blessing for me. I wonder how many angels I have neglected hospitality. I am so thankful that God forgives and forgets! God bless you brother. Hospitality comes more naturally to me so it is not a stretch for me to open my home. My hubby and I have a lot of opportunities to host missionaries and are so blessed by their stories. I think the biggest fault lies in the church. We are not challenged enough by our leaders to get out of our comfort zones. When I visit a church, if I get greeted at all, it is usually the standard, “Hello. How are you?”, as the person walks away to talk to their friends. If this is how the greeters in the church do, why should we expect anything more outside the building. It’s humbling to say, but I’m a Christian who’s been in need of hospitality for many years. Due to a somewhat complex issue, I’ve been homeless for several years. All the shelters I’ve been at are served by Christian churches. But I’ve desired to grow, a hand up; yet only hand outs are given as there’s no hospitality. I needed just some hospitality to get out of this, but none was available. When I was in college, I took someone under my roof freely; when he left, he took my bike. Yet, I never changed my attitude about being hospitable to people. I believe one either has it in the heart or doesn’t. I’m still homeless now, hoping that someone somewhere will reach out with hospitality to me just like I reached out to others in the past. Currently at the church I attend (and, incidentally also the secretary for) we have extended hospitality to some folks who are for all intents and purposes, homeless. They have a small trailer that they can live in (unlicensed) that we said they could park on our church property for a week or so until they could find somewhere to park permanently. We have no hook-ups (sewer/water) other than an electrical out-let (legally, I think we’re only supposed to allow on property for 3 days being as how we are not set up for “camping”). We have helped with food and various other things. The problem is, that the more we try to help, the more they seem to want. We have even offered to help find them a permanent place to stay, have asked if they have plans that we can help facilitate, but. . .nothing. It is now three weeks. My question is: where does hospitality end and enabling begin? We want to help them get on their feet and be productive as possible, but they seem not to want to even help themselves. And, frankly, we are starting to get weary. Any suggestions? I think you make a good point. Their 3 days should be dependent upon doing something like mowing the yard, picking up trash on the church property or something. Sometimes when we help those in hard places they do take advantage of churches and people so set a 3 day limit and that’s it. Tell them that up front. If they don’t agree to it, then they must leave. Make up a small contractual agreement that they must sign and date and agree to leave church property in 3 days (or whatever number you prefer). Part of the problem is that we might be interfering with God’s trying to humble them and break them to make them see their hopelessness without Christ. We help them but then we get between the rock (the hard times) and the hammer (God’s working on them to humble them). The best thing we can do is to let people hit rock bottom so that they can only look up. I would close it myself and then only offer one meal a day and lock up the trailer. You seem to be enabling them and so they see no need for God with a full stomach and a place to sleep so let God break them and drive them to their knees thru difficulty, otherwise you’re getting between the rock and the hammer. I’m sorry; I don’t want to come across as ungracious. I do know that “there but for the grace of God am I”. Please pray that I can remember to love them even when they seem unlovable. Pray for me. I just know that I need to remember that God is in control, not I.
I know I have been wanting to invite people to the house but have been lazy about it.. making excuses ! my mom ( Lord rest her soul ) was a wonderful hostess, she loved the Lord 🙂 she welcomed anyone in for coffee & if you were there more then 5 min.. she had the table spread with all manor of food.. from relish to sandwiches or “you must try this pie, it’s one of my best “. she did so her entire life. I learned from her open heart example. thanks for the reminder to get busy ! I am really struggling with this issue. I have been helping a woman I met when she was homeless and pregnant. I give her rides to church, work, her son’s daycare, school and to run errands. It started off as “When you need it” and she kept it to a minimum. But now she isn’t homeless anymore, she has a job and welfare has sent her to school. But now she no longer asks about any rides. She just assumes and expects me to be there. She hasn’t offered to give me gas money either. She has no idea that it is inconvenient to me to spend 30 minutes twice a day to get her and her son to where they need to be. I’m a stay-at-home mom. I think she just views me as having a cushy life that can spend the time to take care of her. And for the most part, that is actually true. But it has been three years now and I’m just wondering (and asking God too) how do I know when I’m being taken advantage of? It has been so gradual and she is making great progress, but I’d like to not have the cost of gas and car maintenance that this requires. I also think that sounds a little selfish. Please give any encouragement or guidance. Previous post: Is The Old Testament Law Still Important Today? Next post: How Is Satan Disguised As An Angel Of Light?